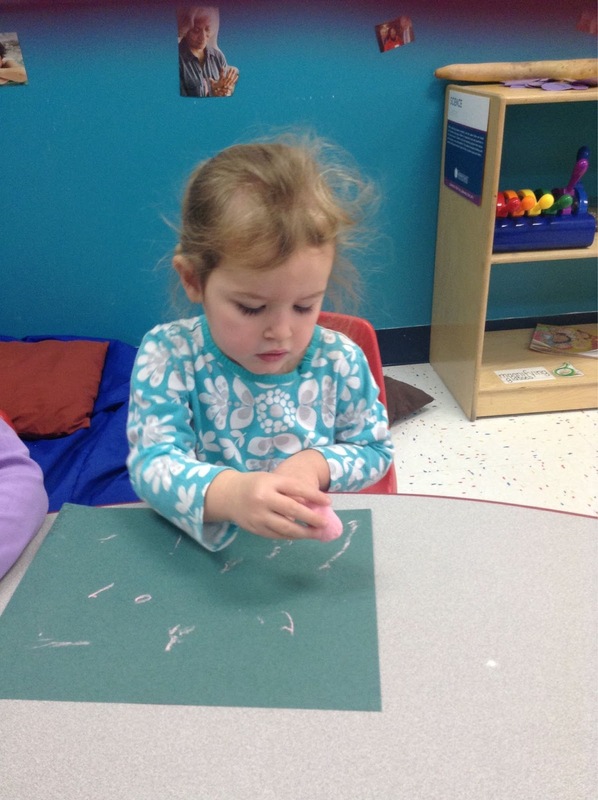 3/1/16: Charlotte had so much fun coloring with chalk today. 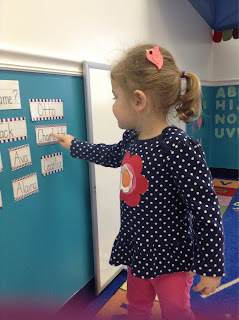 She also did an awesome job of finding things in the room that start with the letter ‘C’, including herself! 3/2/16: We had fun talking about different things in the room that are round like a tire. 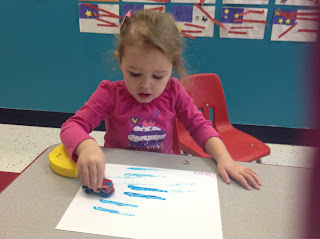 Charlotte loved using a toy car to paint with. 3/3/16: Charlotte did an awesome job of recognizing her name on the wall! Great job! 3/8/16: What a beautiful day! While we were outside we had fun finding our shadow. 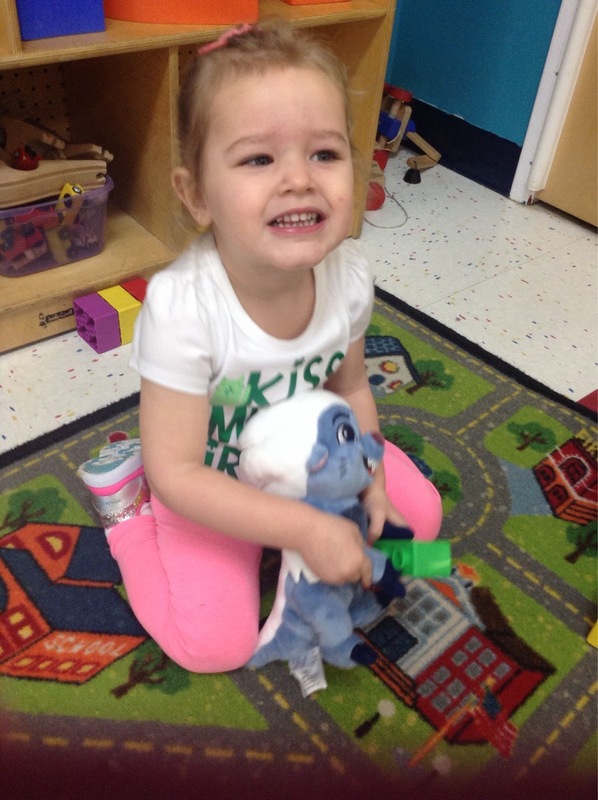 3/14/16: Charlotte had an awesome day. She really enjoyed playing outside! 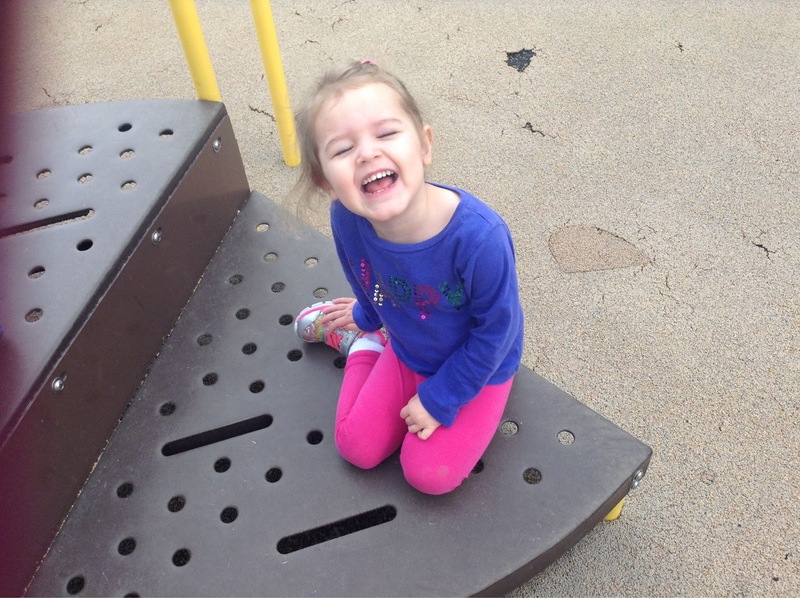 3/22/16: Charlotte had so much fun playing outside today. She had so much fun racing her classmates down the slide. 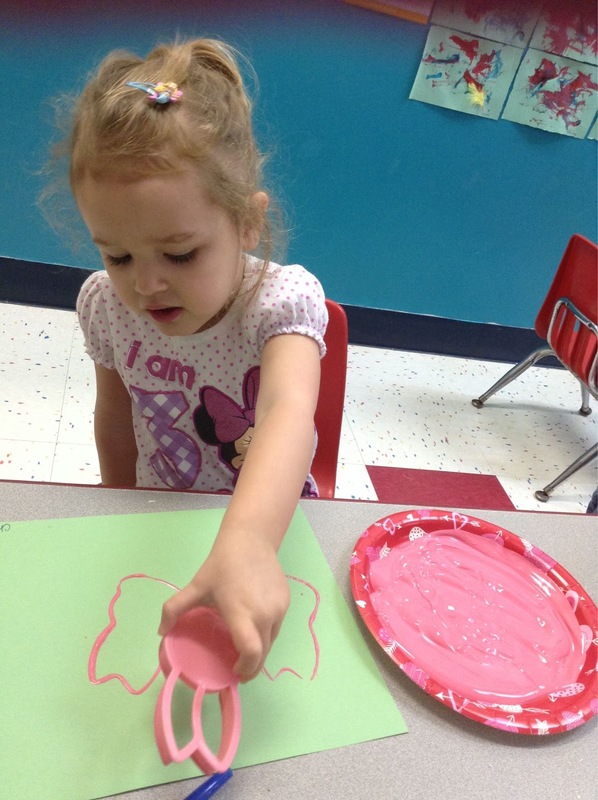 3/31/16: Charlotte loved doing art today with the paint and cookie cutter. She also had fun hopping around the room like a bunny. So much fun!! We didn't make it to Pittsburgh this Easter, but I brought a little Pittsburgh to us by making Mike's favorite side dish, deviled eggs. Turns out he had to fight for his fair share after this little (big) girl realized she loved them too! Sometimes your husband's company is acquired and he's tasked with selling a few new products. Sometimes those products require hands-on training and continued practice. Sometimes your husband may ask to practice on you. And you may, despite the many medical procedures you've been subjected to, be a little squeamish. And pregnant. And therefore unable to drink. To say that the casting and sawing depicted below is something I will never forget (in a VERY BAD way) is an understatement. Our marriage is strong, but not "come at you with a saw" strong. From now on he'll be practicing on those with a little more perseverance (and trust) than me! You’re three! I have no idea how this happened or when you decided to grow-up, but it’s happening right before our eyes. 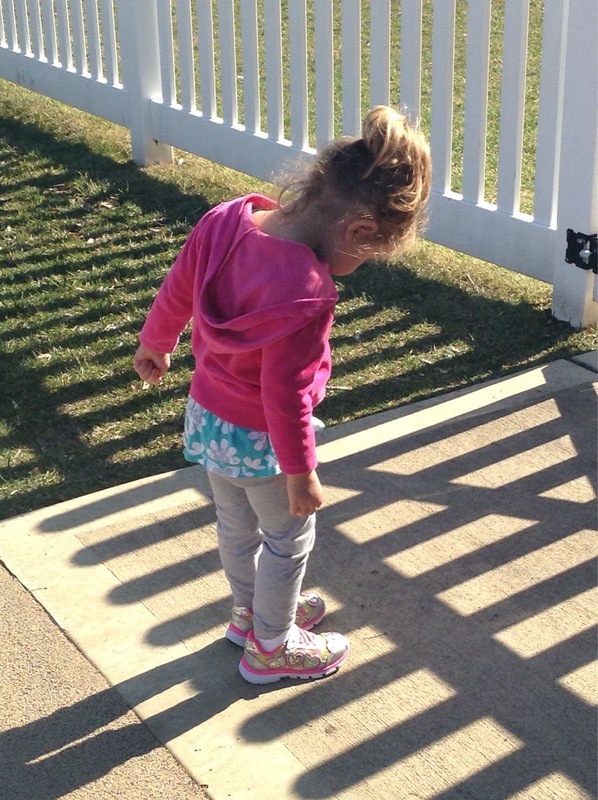 I look at you most days and see a baby and a big girl finding her independence all in one sassy girl. You and your sister are alike, but oh-so-different in so many ways, and you have a personality all your own. I love watching you grow, often cringe at the things you do and say, and am cherishing the snuggles and hugs and cuddles because I know you’ll be a tall, bony girl like your sister before I know it. You’re an OK eater … when we can actually get you to stay at the table. You ditched a high chair / booster chair loooong ago, so you have free reign at the table and often choose to come and go as you please. Your M.O. that started a few months ago was that you’d snub most of dinner, then demand basically a full meal before bed, so we’ve started covering your plate and that’s the food you eat when said demands kick in. And it works! You generally go back to the table, granted 2 hours later, and finish your dinner. Whatever works, right? You insist I sit next to you at all means, and usually that means literally *right* next to you, leaving your Dad and Anna at the other end of the table. You love all the typical foods of a three year old palate: chicken nuggets, PBJ, pizza, fruit, snacks, and very few veggies, although you love frozen peas and surprised us a few weeks ago by eating more than a serving of green beans. If you’ve had a good behaviour day and eaten most of your planned meals, you get a treat before bed. Soooooo, pretty much that means you get a treat about twice a week. You’re a big talker and have a lot of ideas. You’re not afraid to let us know what you’re really thinking and often times run around yelling at us like a crazy person. On the flip side, you really don’t like it if we raise our voice at you or if your Dad and I start to have a heated conversation. I tend to be your interpreter when we can’t understand you … sometimes because you’re just talking jibberish, but mostly because you’re hard to understand when you’re barking demands at us or whine-talking. You absolutely adore your big sister and watching you two interact and play together warms my heart on a daily basis. You love to play Paw Patrol, Lion Guard, and PJ masks, all of which involve crawling around and making odd noises and roars at one another. 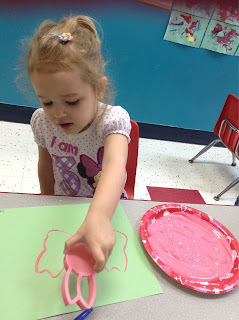 You’re a girly girl and love all things pink, purple and yellow (your three favorite colors), but because your sister has passed her princess phase, you aren’t nearly as into it as she was. Speaking of love affairs, you love your Daddy too. You two have special games you play and cues you take from each other and you love nothing more than to have him chase you around the house, ending in a big tickle fest. You’ve recently started belly’ing up to him at the end of the day and you two literally snuggle into the love seat together and catch up on the latest Paw Patrol. Your teachers love you and have actually asked to keep you in your current classroom past the traditional transition point … partly because you aren’t yet potty trained, but mostly because you are such a sweet girl. They’ve only seen snippets of your sassy attitude, so the old adage remains true that kids are generally perfect angels for anyone that’s not a parent. You’re a pretty good sleeper, but definitely take some time to wind down and will play with the MANY stuffed animals in your crib for a good hour (or longer) many nights after we put you down. You’ve tried the “I’m hungry and thirsty” bits and that worked for a little while … now I just promise to come back with a snack and tell you to close your eyes until then … and *bam* you generally fall asleep. You are an early bird, up between 6 and 6:30am most days. 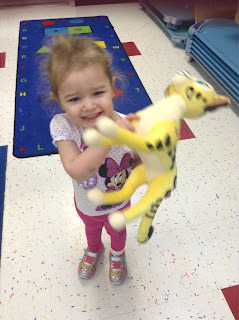 Luckily you’re usually happy to play with your stuffed animal brigade until I can get you up. Occasionally you’ll get feisty and start yelling for us to come get you with sassy sayings that include “Hello, I’m awake, can you hear me?” and “Is anybody out there going to come and get me up?” On the weekends you prefer to ease into your day with a snack and a TV show and on the weekdays you beat your slow poke sister by leaps and bounds when it comes to getting ready (although you have the unfair parental help advantage). Charlotte Rose, you’ve been such a blessing to our family; you’ve challenged me in ways I never knew were possible, you give the best and biggest hugs and kisses, you are a snuggle-bug to beat all snuggle bugs. You’re as sassy as you are sweet and although I know you’re now a full-on threenager, I can’t wait to see how you grow and change this year!